David Cameron welcomed the Turkish Prime Minister, Ahmet Davutoğlu, to Downing Street yesterday. 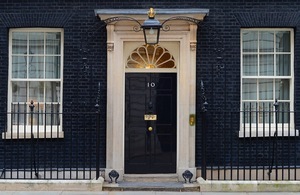 The Prime Minister welcomed the Turkish Prime Minister, Ahmet Davutoğlu, to Downing Street yesterday for bilateral talks where they discussed a range of issues including the situation in Syria and the Supporting Syria and the Region Conference, tackling terrorism, migration and the Cyprus settlement. Discussing the situation in Syria and looking ahead to the Supporting Syria and the Region Conference, the Prime Minister welcomed Turkey’s announcement to introduce work permits for Syrian refugees, highlighting this as the type of action needed as part of the international response and encouraging its swift implementation. They also discussed the importance of education and ensuring refugee children can get access to schools as a means of providing hope and opportunity to refugees, with the Prime Minister acknowledging the great deal of work Turkey has done in this area. The Prime Minister’s also discussed the need for the international community to come together and substantially increase financial support for the crisis. On terrorism, the Prime Minister offered his condolences following the attack in Kilis yesterday and in Istanbul on 12 January. They agreed to continue working closely together on security co-operation. On migration, the Prime Minister and Prime Minister Davutoğlu discussed the EU-Turkey action plan, agreeing that it was vital to implement the agreement without delay. Finally, the Prime Minister and Prime Minister Davutoğlu briefly discussed the Cyprus settlement with both leaders reaffirming their commitment and support to both sides as they continue to work towards an agreement.